Our tarragon is lush just now. 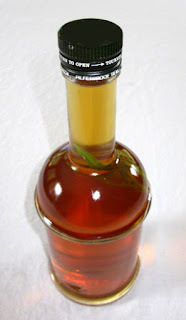 This vinegar recipe, great in salads and especially in Green Goddess dressing, makes the tarragon last all year. Heat the vinegar in a non-aluminum pan until it is just about to boil but not boiling. While it is heating, wash and dry the tarragon leaves, being careful not to crush them. Gently push the leaves into a warm, clean glass jar with a capacity greater than a quart. When the vinegar is warm, pour it into the jar and close the jar loosely. Tighten the jar lid after the vinegar cools. Place the jar in a cool, dry place for 3 days, gently shaking it twice a day. Do NOT try to shake the bottle just after you pour in the hot vinegar as it may leak or explode. Copyright 2012, Wilder Brook Farm.. Simple theme. Powered by Blogger.